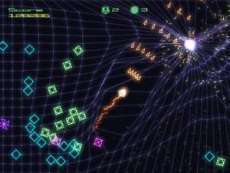 This was a free fan-made PC version of the popular Xbox 360 game from 2005, Geometry Wars. For players who do not own a joypad, keyboard and mouse controls are supported as well. Your ship can be moved around using the arrow keys. Aim using the mouse, hold the left mouse button to shoot and right click to detonate a bomb. Press the P key to pause. Your weapon is automatically upgraded every ten thousand points. It is written in Blitz Max and it contains all the features of the Xbox360 original. The game is no longer updated and play time is limited to six minutes. After that the game resets.